How's your Christmas shopping coming along? Every year I say I'm going to get it done early, and every year it gets to be December and I realize I have nothing done. The last few weeks I've been in the zone though, so although I'm not completely done, I'm close. While I'm doing all that shopping for other people though, I can't help but make a list of all the things I want this year. Here are a few things on my wishlist. 1. The Chew Box Calendar. Just like I look forward to picking out a new planner every year, I also can't wait to pick out the next year's box calendar. I love having a fresh page to look forward to every day of the week. Although I never watch The Chew anymore (dang day job) I love that show and I think there would be some great recipe ideas in the calendar. 2. Cuisinart Food Processor. If I still wrote a letter to Santa, this is the thing that would be at the top of my list. The thing that I would justify with all the examples of what a good girl I've been all year. And all the ways I'd use it, and all the things I'd make. I'm not above bribery, Santa. I'll share the first thing I make, whatever it is, with you. 3. Local jewels. I'd love to update my jewelry box with a few pieces from two of my favorite Kansas City-based designers. I went to a trunk show held by Ngan of eNVe Designs earlier this month and found lots of pretties I'd love to add to my collection, like this necklace. I've also had my eye on this leather cuff from Nickel and Suede; it looks comfortable and wearable, even for a non-bracelet-wearer like me. 4. Tervis Water Bottle. Okay, so this may seem like a silly thing to have on a Christmas wishlist, but I've had such a hard time finding a stinkin' water bottle that I like! I take one to work every day, and I can't seem to find one that doesn't break or doesn't leak, or doesn't sweat, etc. I have a few Tervis tumblers that I use all the time at home and I love them; I think a water bottle would hold up just as well. 5. Gap Sweatpants. My pajama/lounge-wear collection is in a sad, sad state. Most of it consists of pants I bought to wear around the house after I had Jona. Comfort is happening, but cute is nowhere to be found. I feel like these sweatpants have a little bit of both. What's on your Christmas wishlist? 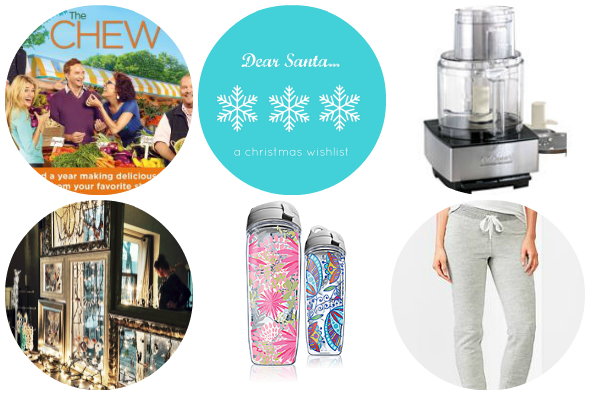 See what other bloggers are wishing for at The Circle linkup. Oooh heck yes to the food processor! I love The Chew- that should be a great calendar. I'm also not done with Christmas shopping, wrapping, and mailing. I can't believe it's less than a week away Hopefully Santa will get you that food processor. I know, right? I mean I NEED this! I know, this happens every year, but how does it get here so fast!?! We'll get it done though. :) And I hope you're right about Santa. I'm still on hunt for Christmas gifts, but it put away for a moment because of flue. First my fiance now me. That's not fun at all. So looking forward decorating Christmas tree, finishing decorating house and getting those last gifts. You have such a great selection for wishlist. I hope you will find it under your tree. Oh no, I hope you feel better soon Ramona! I'm starting to come down with something myself. 'Tis the season I guess. Anyway, thanks!! Thanks Anne! Ooh a beach one sounds dreamy (although yes, maybe a little taunting at times). My favorite is always a "book lovers" one, but I still have books left to read from calendars past! I was just gifted a book lover's one by a book club friend actually! Looking forward to opening it on January 1 but I anticipate similar "to read" list issues. My parents used to always get a New York Times crossword one, which was fun but completely impossible to keep up with. Now they don't need the calendars because they've still got so many leftover puzzles from years past, ha. I have such a thing for water bottles. I always find myself in that aisle of Target. I have a few too many. ;) Those ones are so cute! Thanks Leah! I always get one and then it breaks or leaks or something...I have bad luck with them!